Feline vaccinations are an important health consideration for every cat owner, and knowing which vaccines your cat needs can help you make sure she stays up to day. Keep these expert tips in mind as you make decisions about your cat's health. Meet Dr. Ann E. Hohenhaus, DVM, ACVIM, and Chairman of the Department of Medicine at The Animal Medical Center in New York City. Following are her answers to many commonly-asked questions about feline vaccinations from our LoveToKnow Cats community. 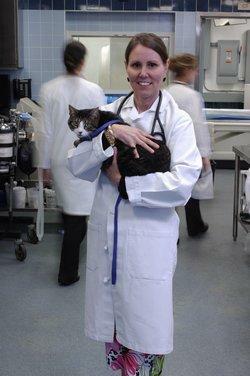 Dr. Hohenhaus, why are feline vaccinations necessary to protect our pets' health? The first two diseases are quite frequent in unvaccinated cats, but are usually not fatal, although a young kitten or very elderly cat could succumb to them. In twenty years of being a vet, I can't recall a cat ever recovering from panleukopenia, yet it is very preventable with adequate vaccination. A veterinarian may recommend other feline vaccinations called "non core," based on conditions in your geographic area and your cat's lifestyle. Which illnesses should every cat be vaccinated against? Every cat should have an assessment made of its risk for developing diseases that can be prevented by vaccination, as well as its risk of a vaccine reaction. The owner and the veterinarian can then make a decision about what diseases should be included in a vaccine protocol for that individual cat. Please explain why it's necessary to give a series of feline vaccinations in order to build up initial immunity, and what that schedule for giving those boosters should be. Antibodies, key to providing immunity against infections, are made by immune system cells, and block the ability of viruses to cause an infection. 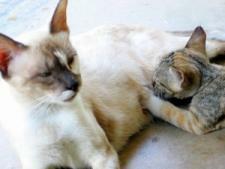 For a brief period after birth, kittens get their mother's antibodies from nursing. Those antibodies do not allow the kitten to make antibodies of its own. At some point - between one to four months of age - those antibodies wear off, and the kitten is susceptible to infection. The problem is, we don't know exactly when the antibodies from the mother will wear off, so we administer feline vaccinations multiple times to ensure the kitten is vaccinated at a time when it can make antibodies of its own. The first time a vaccine is given, the immune system responds over the next ten to fourteen days to begin making antibodies. When a booster dose of vaccine is administered, the body has a stronger and more rapid immune response because of special memory cells that remember the virus from the previous vaccination. It makes a more vigorous immune response, giving added protection against infection. Therefore vaccinations are typically given to kittens every three to four weeks until they are sixteen weeks of age. Are yearly boosters really necessary for a healthy cat in the prime of its life? The 2006 vaccination guidelines developed by the American Association of Feline Practitioners Feline Vaccine Advisory Panel suggest that, after an initial series of kitten vaccinations and another vaccination one year after the final kitten vaccinations, tri-annual vaccinations (every three years) are adequate for most cats, with rabies vaccinations given in compliance with local laws. What about vaccinating ill and/or elderly cats? Staff veterinarians at The Animal Medical Center in New York City have recently reviewed the literature on this topic, and there is scarce information about the risks and benefits of vaccination in ill or elderly cats. In general, veterinarians will not vaccinate an acutely ill pet, but some cats with chronic diseases, like cancer, diabetes and kidney failure, may need vaccinations to ward off a preventable disease while the cat is battling a chronic incurable disorder. In cats with a chronic disease, an acute upper respiratory disease may decompensate their chronic disease from which the cat cannot recover. What can be done to make feline vaccinations less traumatic for pets that have reactions to the boosters? The most common reaction to a vaccination is an allergic one. If it is mild, antihistamines administered before vaccination may be enough to prevent a reaction. An assessment must always be made regarding any medical intervention as to whether or not the risk of the treatment outweighs the benefit. In some rare cases, vaccination may not benefit a cat at all. Thank you for sharing your expertise with us Dr. Hohenhaus. Are there any final thoughts you'd like to leave us with? Yes, all medical and surgical interventions, including vaccinations, should involve a conversation between the cat owner and the veterinarian about the cat's lifestyle, the owner's preferences, and the veterinarian's recommendations to make sure informed decisions are made.